Christmas Teddy contains a music box which plays the Christmas classic, 'Winter Wonderland'. 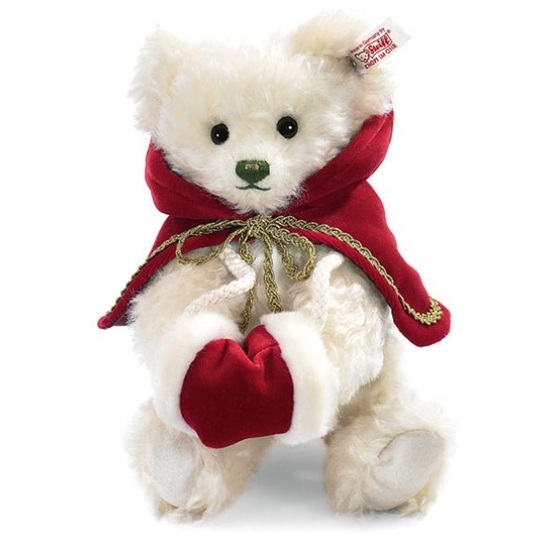 Steiff Bears excel themselves again with this beautiful Christmas teddy bear. She is made from the finest pure white mohair, with a stitched nose in Christmas-tree-green with a sparkle of gold. She is wonderfully dressed for a cold winter's day in her red velvet cape with gold braid and matching muff trimmed with white plush fur. Steiff's Christmas teddy bear is even more special as a seasonal treat for yourself or a friend - she contains a music box which plays the Christmas classic, 'Winter Wonderland'. She is supplied in a Steiff box with numbered certificate of authenticity. She is a limited edition of 2011.